It is that time of year! Time to mix and mingle with the nation’s top animal care providers and find out what is hot at the Western Veterinary Conference. You may be wondering what was happening on the banner image you clicked on. I was reeled in by some rabid animals! Bat, fox, skunk…but no worries, I was vaccinated so I was safe #stopthelurkingdread. In real news, there were many new product launches at the show. 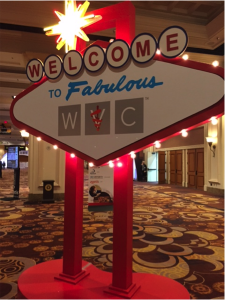 After checking things out, here are my picks for the best new finds at WVC 2016. The Merck Veterinary Manual (Booth#4440), the industry reference guide every veterinarian must have in the office, is about to launch a redesigned and revised 11th edition, available for pre-order on Amazon (http://www.amazon.com/Merck-Veterinary-Manual-Susan-Aiello/dp/0911910611). 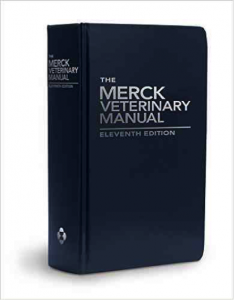 To learn more about the manual visit http://www.merckvetmanual.com/mvm/index.html. When asked for the release date, the inside scoop was “about June 1st.” Looking forward to it! A therapy formerly used for healing racehorses, hyperbaric chambers create an oxygen-rich environment that help treat infections, build endurance, and assist with injury recovery. 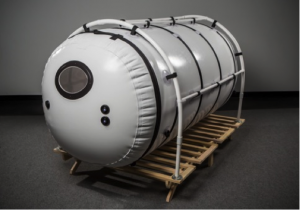 By gathering more oxygen in the lungs and having it distributed throughout the body, the chamber helps fight bacteria, while stimulating stem cells and growth factors. Healing is promoted for a variety of conditions, including burns, skin infections and other crushing injuries. Made to be animal-friendly, multiple sound suppression options have been put in place to address the sound sensitivity of our pets’ ears. FDA approved, vets and pet owners can rest assured that Pet Pressure’s (Booth #1531) hyberbaric chamber heals with maximum comfort. Learn more at http://www.petpressure.com/. As a vet, where do you go when laser therapy doesn’t work? 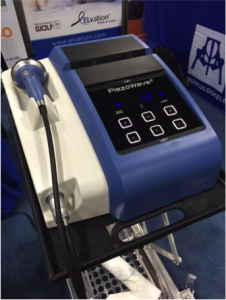 The PiezoWave2, sold by Mulculoskeletal Therapies for Animals (Booth#4246) is the second generation “go to” for shockwave therapy. Made by Richard Wolf and ELvation, the laser has a range of sources: focused, planar and linear (which is new). The lifespan is up to 5 million pulses, and it offers single and double layer technology. What makes it unique? The PiezoWave2 was made for small animals, unlike other shockwave therapy devices. The company is so confident in their product, they will let veterinarians use it, and then let them decide whether to keep it afterwards. Read more about MTA at http://www.mtavet.com/. 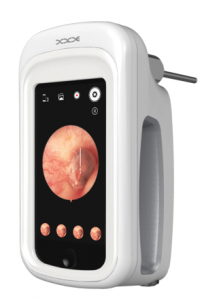 The XCope by Design 36.5 Co. (Booth #4147) highlights the next wave in smart medicine. Apple iPhone compatible (5/5s and 6 generations), it combines real-time data synchronization with backup mirror monitoring. 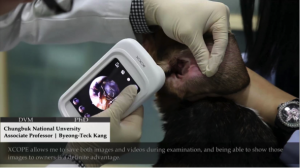 Designed for single-hand use and made to be mobile, the Xcope is wireless and comes with multiple attachments that make it easy to adjust for a variety of endoscope needs. It also updates regularly via the Apple Store! For more information visit http://www.xcope.co.kr/. 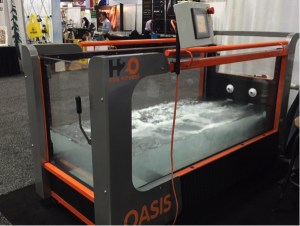 H20 for Fitness (Booth#4245) demonstrated their chic, yet affordable Oasis underwater treadmill for canine rehabilitation. Keeping pets fit, while easy on the joints, the buoyancy of water offers a low impact hydrotherapy workout for patients. Known for their exceptional customer service, the company offers the full package with great products at a competitive price. To learn more about their hydrotherapy products, visit http://h2oforfitness.com/. One of the press conference highlights of WVC happened on Monday morning, when Ceva Animal Health took over the media room with over three dozen media and influencers to share exciting research that supports a change in the veterinarian’s heartworm protocol. The new campaign slogan is Double Defense, #FightHeartworm is the hashtag and a “who’s who” of prominent researchers and veterinarians also presented – Dr. Robert Wirtz retired chief of the Entomology Branch of the Centers for Disease Control , Dr. Tom Nelson, Past-President and Executive Board Member, American Heartworm Society and Dr. Elizabeth Hodgkins, Technical Services Director for Ceva Animal Health and last but not least, John McCall, MS PhD. Dr. McCall presented his groundbreaking study showing success in heartworm prevention when an oral heartworm preventative is used alongside a topical parasiticide to kill and repel vectors. 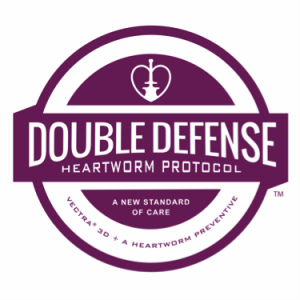 The same mosquito that transmits Zika, Dengue and Malaria is responsible for heartworm, and using the combination of the two in Double Defense is the best way to stop heartworm in its tracks. Personally, I have been following Zika every day and everything mosquito makes me nervous, so happy Ceva is doing something to help! To learn more, read the full press release here (http://goodnewsforpets.com/research-supports-change-in-heartworm-protocol/).